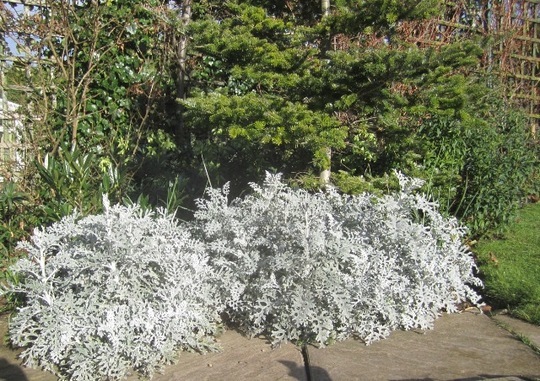 ground cover plants : All year round silver/white colour. You can return to our ground cover plants page or browse the pictures using the next and previous links. All year round silver/white colour. If you want to have a little silver/white colour in the garden all year try some Cineraria silver dust. This supposed annual I set seed for 5yrs ago has gone through all these awful winters unscathed. yours do look wonderful...mine sadly look weather worn! Hi Shiela, although this is ususlly grown as an annual, it is in fact a perennial evergreen sub shrub or shrub. The powers that be reclassified it some years ago as Senecio cineraria, it is supposed to be only frost hardy, but I have found that it can take a lot lower temp than minus 5 c, a very nice, very useful plant, Derek. Thanks for that info Derek. I cut it right back at the end of spring and it shoots up brilliantly Marybells. I have it too and it grows nicely on Vancouver Island(as perenial). I cut it back in the spring as well Homebird. It can grow very spindley if I do not. Yours looks wonderful right now...very bushy and heathy looking. A neighbour grows this in his very exposed front garden and it does well up here for him too as a perennial. Mine doesn't look quite so clean & perky as yours HB. Thanks for the reminder to cut it back in a bit later on.